Make Your Way For A Glittery Christmas! Christmas is almost here! The festive way to celebrate is always to feast into the holiday season together with family and friends. Back this year for the famous Chatz Brasserie’s Christmas Day Marathon Buffet, it’s a whole day of indulgence. 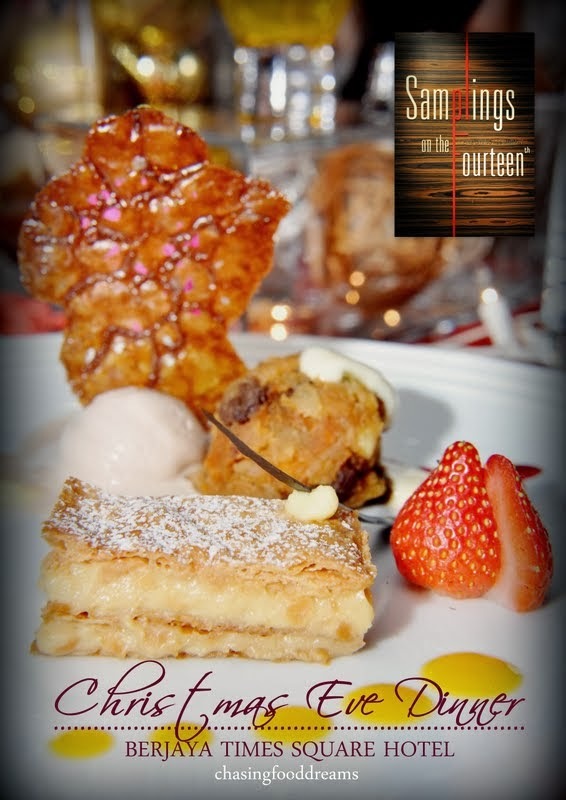 Read about my previous Chatz Brasserie Marathon Buffet here. One will feast on the favorite of the holiday season with a duo of turkey! A Cold Roasted Turkey makes a fabulous change while the hot Roasted Whole Turkey has always been a must. Let’s not forget all the trimmings to go with this like Chestnut Stuffings, Cranberry Sauce and Giblet Gravy. Seafood on Ice is simply another must as we all dine on the treasures of the sea! The hot station serves up plenty of Western delights this year such as Pan Fried Salmon with Caviar Cream Sauce, Chicken Schnitzel with Strawberry Balsamic Sauce, English Cut Roast Beef, Christmas Turkey Giblets and Gizzard Quiche, Buttered Brussels Sprout and Roasted Rosemary Potatoes. Of course there are more dishes as these are just a sneak peak of some of the highlights. There are also local delights at Chatz Brasserie such as Chicken Rice, Dim Sum and Roti Canai at all the live stations. Desserts are marvelous so make sure to save some room for Christmas Fruit Cake, Warm Christmas Pudding, Christmas Stollen, Yule Log Cake, Mince Pie, Orange Cheesecake and more. There is even live action station making Fried Churros with Cinnamon Sugar. PARKROYAL KUALA LUMPUR also continues to play its role in corporate social responsibility towards the less fortunate. During the season of Christmas, the hotel continues to help the children at Stepping Stones Living Centre, a Home for children from needy and broken homes. Founded in 1998 by Pastor Johnson, children, single mothers and senior citizens are taken into the Home, presently located in Taman Seputeh, regardless of background and belief. Well-wishers can make Christmas for these children more memorable as they are in need of new uniforms and shoes for school next year. To contribute, choose a Christmas Joy envelope from the Christmas tree in the lobby. The Home will very much appreciate your generous contribution. Dine away from lunch until dinner at an amazing price! Christmas Roasts, its side orders, Christmas Mince Pie, Chocolate Log Cake and much more!! Let’s countdown to the New Year beneath the stars! Groove the night away with a live band performing contemporary, classic jazz, pop and some country music. Party and be merry with our fine selection of house pouring, beer, wine and spirits. A Time for Lots of Indulgence! 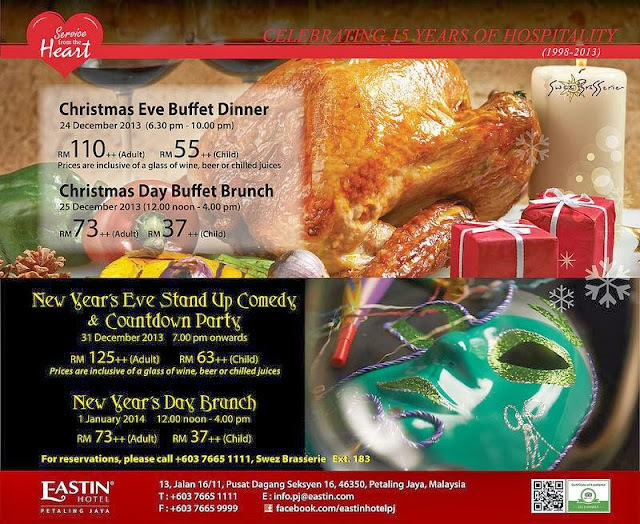 If you are still looking for somewhere to take your family this festive holiday, let Eastin Hotel Petaling Jaya take you in a merry gastronomic journey for a merry yuletide spread of irresistible indulgences. Back at Swez Brasserie, this round had us taking a sneak peak of Swez Brasserie’s Christmas Eve Dinner and Christmas Day Brunch. As usual, there’s plenty to please everyone and everyone gets to taste what Christmas is all about. Check out the star of the festive season with a golden Honey Roasted Turkey served with all the trimmings and Giblet Gravy. The delicious aroma of the turkey fills the air and one will need to try this with the luscious spread of trimmings and gravy. Enjoy Roasted Potatoes, Vegetables, Cornbread Stuffing with Sausage, Fennel with Bell Pepper, Bread Stuffing with Beef Bacon, Apple, Sage & Sweet Onions, Bread Stuffings with Dried Fruits, Cranberry Mustard Relish, Cranberry Orange Compote, Beet Chutney and Giblet Gravy with the turkey. Appetizers are plenty and pretty, from sweet Chilled Salmon to Chilled Scallops with Mango, Lamb Rillette, Seared Tuna with Saffron Aioli, Ham with Melon and lots more. Of course there is always the salad bar and the soup stations where a hearty Pumpkin Bisque awaits. 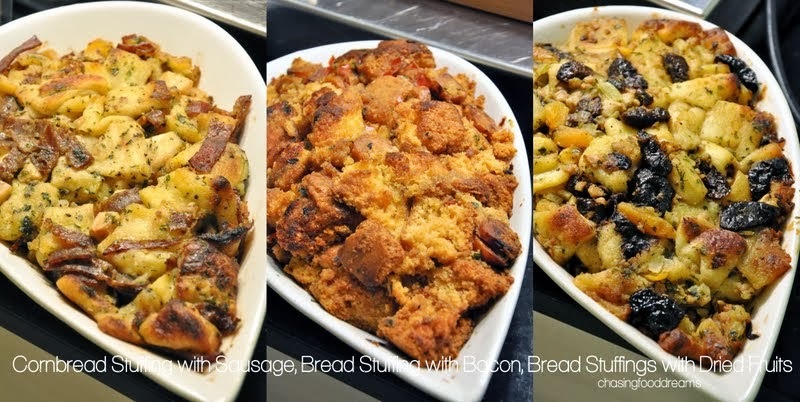 The hot bar serves up plenty of festive hot food. Sink your teeth into succulent Braised Beef Briskets with Mushroom Aioli and Peppercorn Sauce, Pot Roasted Lamb Shoulder with Roasted Butternut Squash and Sweet Onions, Swordfish with Caramelized Eggplant and Roasted Tomato Salsa, Peri Peri Chicken Scallopini Stuffed with Chicken Chorizo Sausage, Chesapeake style Crab Cakes with Sweet Corn Salsa, Wild Berry Pilaf with Beef Meatballs and Streusel with Sweet Potato. For the ‘love of shuck’, I heard that there will be freshly shucked oysters with cucumber jelly, tomato shooters, green papaya relish, fresh seafood too. Live actions serving up a la minute dishes like Paella Valencia, sizzling Portabello Mushroom, Nachos & Fajitas and more are also part of the buffet. Make sure to savor a very delectable Rambutan Lychee Tempura stuffed with Turkey and Cheese Mousse as these babies are simply scrumptious! The dessert station is heavily laden with loads of heavenly Christmas desserts. From Christmas Yule Log, Mousse Cakes, Pannetton, Christmas Stollen, Cinnamon Poached Pears, Crème Caramel, Popcorn Balls, Christmas Pudding, Mini Chocolate and Berry Pavlovas. It will certainly make a sweet festive ending to the meal with family and friends! Guess what? Santa will also be making an appearance spread the Joy of Christmas and to give away Christmas goodies to all patrons. 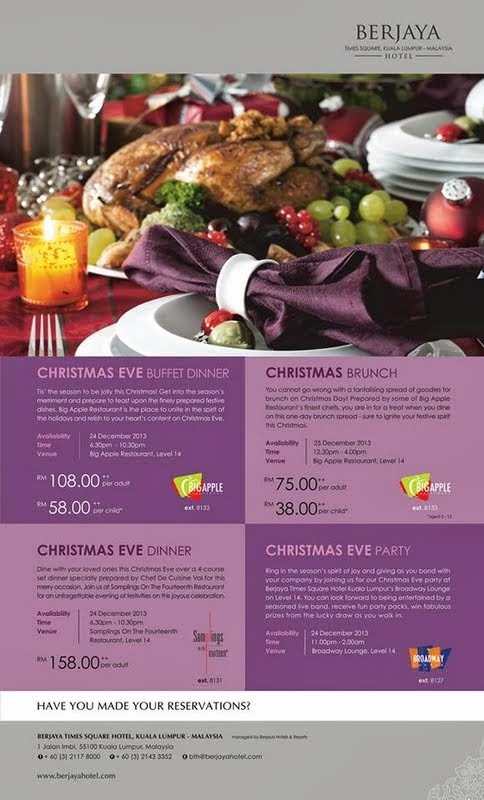 Starting from 6.30pm until 10.30pm on 24 December 2013, the Christmas Eve Buffet Dinner is priced at RM110++ per adult and RM55++ per child. Prices are inclusive of a glass of wine, beer or chilled juices. Whet your appetite on Christmas Day with our Christmas Day Buffet Brunch with a selection of internationally inspired dishes featuring festive specialties like the traditional Beef Roulades with Walnut Parsley, Maple Syrup Whipped Potatoes, Barbequed Squid with Pine Nut Stuffing, Yule log, Christmas Minced Pie, Spiced Pumpkin Tartlets and more. 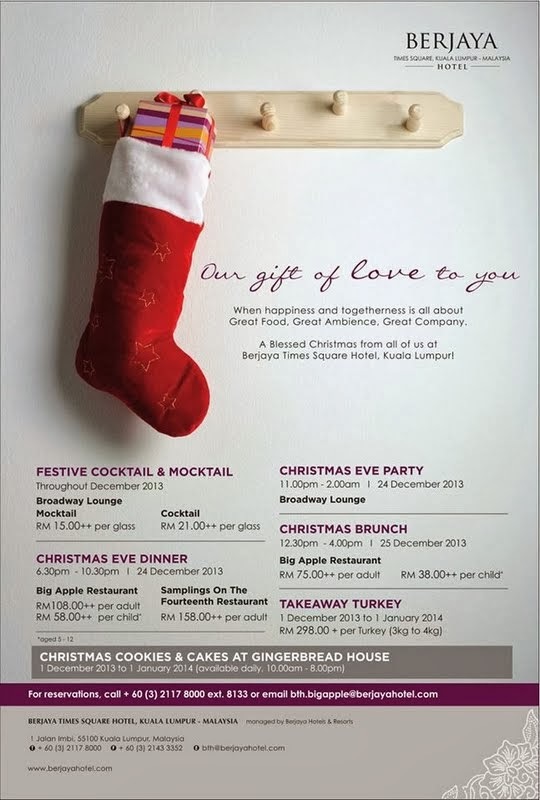 From noon till 4.00p, on 25th December 2013, this Christmas Day Buffet Brunch is priced at RM73++ per adult and RM37++ per child. 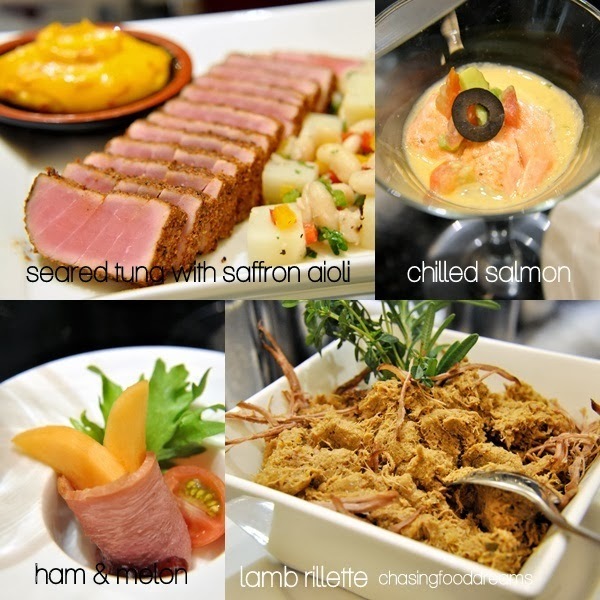 For reservations, please call Swez Brasserie at 03-7665 1111 ext 183.